★★★★★ Tortuga Straps BRAIDZ by Playa Vida -Stylish, Classy and Durable adjustable leather glasses lanyard & cord designed to comfortably and securely retain your eyeglasses and sunglasses around your head or neck. Classic & Stylish Design - Playa Vida's adjustable genuine leather glasses straps are adjustable up to 29" in length & were designed to be quickly & easily adjustable using its Easy Adjust, Full Grain Leather Slider. 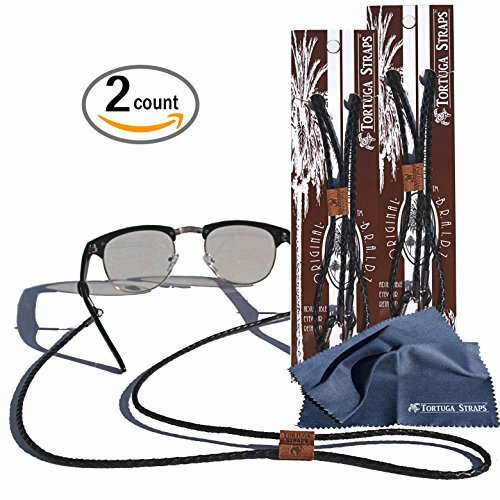 Essential Glasses Strap for everybody from motorists, outdoor enthusiasts, & travelers to anybody just looking to protect their glasses in style and comfort. Pliable and Conforming Universal Adapters on these adjustable eyeglass straps are designed to snugly mold around both large and small arms to securely retain on head or neck. Tortuga Straps BRAIDZ Eyeglass and sunglass holders work with both eyeglasses and sunglasses alike. Never Lose Your Glasses Again A stylish and economical way of providing yourself with the peace of mind of knowing that your prized specs are safe and secure while undertaking your favorite endeavors! . For Those With a Discerning Taste BRAIDZ Eyewear Retainers are available in several distinct leather accents to accentuate almost any style! *Glasses not included. Tortuga Straps, "Accept no Impostors!" If you have any questions about this product by Playa Vida, contact us by completing and submitting the form below. If you are looking for a specif part number, please include it with your message.